Dragon fruit, also known as pitaya, is a tropical, night blooming cactus that originated in Mexico and Central and South America. Spanish explorers spread pitaya to tropical regions around the globe, especially in Asia and Indonesia, where it has become a major commercial crop. 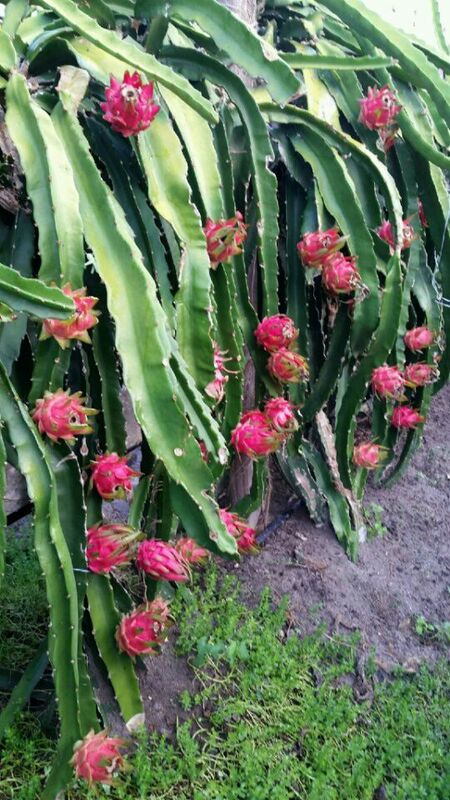 In recent years, as researchers confirmed the fruit’s many health benefits, interest in producing dragon fruit in Florida, California and South Texas has grown. Production is limited, however, as the cactus will not tolerate extended periods of cold. The cactus vines must be trellised and harvest season runs from July through November, depending on weather conditions. Dragon fruit can be eaten as fresh fruit, used in chilled fruit salads, added to smoothies and made into jams and juice. It can also be used in ice cream, yogurt, and made into wine. Dragon fruit is used as a natural coloring agent by the food and cosmetic industries. Dragon fruit is produced by several cactus species, but, commercially the Hylocereus undatus, which has a red skin and white flesh, and the Hylocereus polyrhizus, which has pink to red skin and red flesh are the primary types in commercial production. This versatile fruit is mildly sweet, similar to a melon, with a texture that has been compared to kiwi. Research has shown that it is a good source of beta-carotene which supports eye health. It is rich in Vitamin C and contains the essential fatty acids — Omega 6 and Omega 3 — that support heart health and protect blood vessels. Dragon fruit is also high in potassium and has moderate amounts of iron and calcium. Dragon fruit may also help control blood glucose levels. Today, the local pitaya season begins at the Growing Growers Farmers Market in McAllen’s Firemen’s Park with the red fleshed variety. The white variety will be available in coming weeks. This season should run through mid-November, providing the weather cooperates. The Growing Growers Farmers Market is located on the corner of 1st Street and Business 83 and is open from 9 a.m. to noon. It features a wide variety of locally grown fruits, vegetables and herbs, as well as, artisan goat milk cheese, locally made 70-percent dark chocolate, baked goods, raw honey and an assortment of eggs. Barbara Storz is a local horticulturist. You can listen to her garden show at 7 a.m. Saturdays on 710 KURV Radio or email her at bstorz@rcommunications.com.